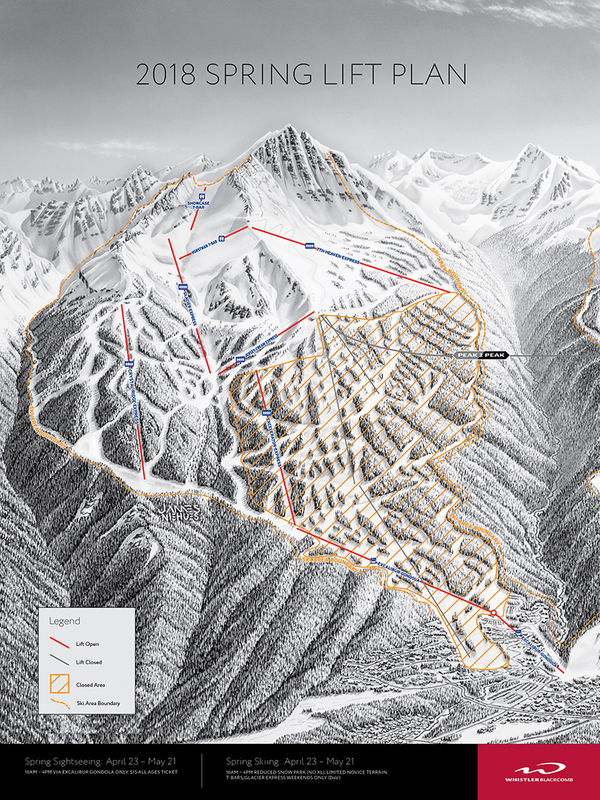 Vail Resorts, Inc. announces that the Company plans to make an historic investment of CAD$66 million (USD$52 million) at Whistler Blackcomb for the 2018.19 season focusing on three new lifts at the heart of the resort. In December 2017, Vail Resorts announced that they are making a CAD$66 million investment into improving Whistler Blackcomb’s guest experience through the addition of a new gondola on Blackcomb Mountain and several other lift infrastructure upgrades. The improvements will be completed in time for the 2018.19 winter season and will be the cornerstone for future development. The goal is to improve traffic flow by expanding upload capacity. Wizard and Solar chairlifts will be replaced with a new 10-passenger gondola that will ascend from the base of Blackcomb Mountain and terminate adjacent of the existing PEAK 2 PEAK Gondola. The new gondola is expected to represent a 47% capacity increase and move 4,000 people per hour, the highest capacity in North America. The Emerald Express four-passenger lift on Whistler Mountain will be replaced with a new six-passenger high-speed lift, increasing guest uphill capacity by 29%. Finally, the existing Catskinner triple-passenger lift will be replaced with a four-passenger, high-speed lift, which will increase uphill capacity by 56%. These upgrades will provide guests a quicker and easier access to all levels of terrain across both mountains. This historic investment represents the largest single-year capital investment program in Whistler Blackcomb’s history. This investment is even larger than the PEAK 2 PEAK Gondola project in 2007, which cost CAD$55 million. 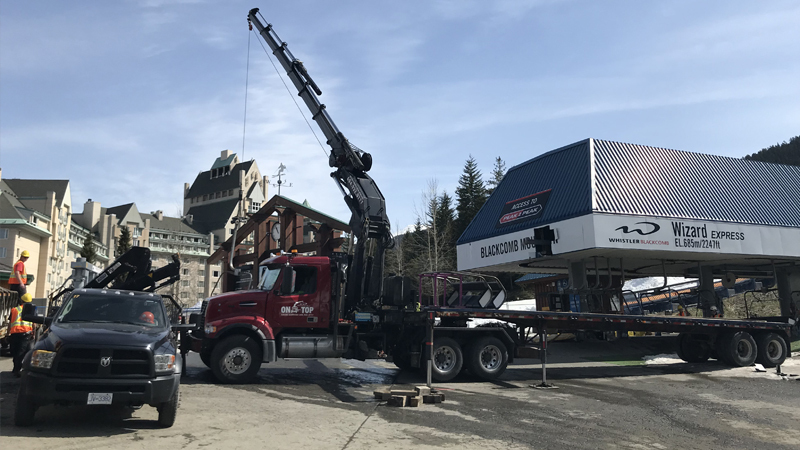 Upon completion, the new gondola on Blackcomb will enhance the longest continuous lift system creating the first three-gondola connection in the world. 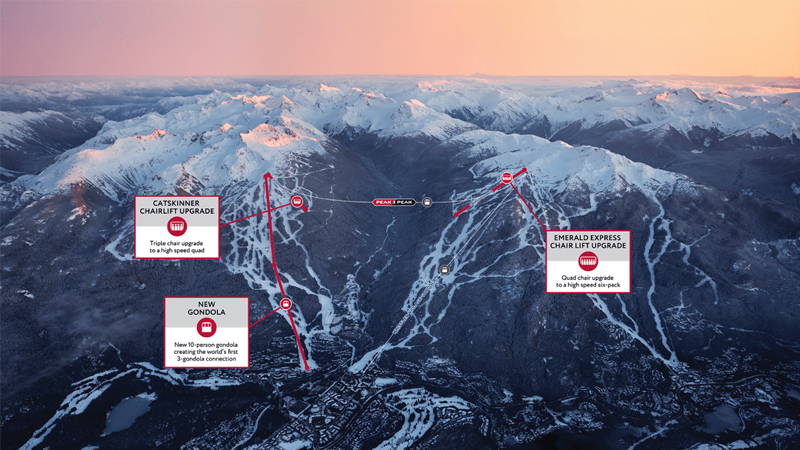 Whistler Blackcomb has long considered putting a gondola in at this location as part of the overall master plan. The Wizard/Solar lifts are a main transportation corridor for the mountain, moving both staff and guests. The new gondola will move guests up the mountain much faster, but also allow for significant improvements for summer/winter operations. Whistler Blackcomb looked closely at how it might retain the Solar Coaster Express with their contractor for the project to find a way to keep the lift. In the end, they could not come up with a plan that would safely allow the install of the new gondola and maintain operations on Solar. The new mid-station on Blackcomb will still be able to serve those guests who want the mid-mountain experience and the upgraded Catskinner lift will also help move skiers/riders to an area that is currently under utilized. There will also be an expansion of the Whistler Mountain Bike Park included in the overall investment plan. The bike park is currently in the middle of a two-phase upgrade that will add 21 km of biking trails for summer 2018. This represents the single largest new terrain opening in the history of the park. “This transformative investment, the largest in the resort’s history, will offer a dramatic improvement to the experience for all of our guests as they explore and enjoy the largest and most popular resort in North America,” said Pete Sonntag, senior vice president and chief operating officer of Whistler Blackcomb. As of April 22, Whistler Mountain Winter Operations have ended and Solar, Wizard, and Catskinner lifts on Blackcomb have stopped running. The removal of chairs has already begun as construction on the lifts are underway. Spring skiing has not stopped on Blackcomb Mountain and will have a closing date similar to previous years, May 21. Guests must upload and mandatory download on Excalibur Gondola from April 23- May 21. Glacier Chair and both the Horstman T-bar and Showcase T-bar will be open for the remainder of the season. For all hours of operations visit the What’s Open page. If you are interested in Spring Skiing, Whistler Blackcomb is offering a Spring 10-Day Pack. For less than $23/day, the Spring 10-Day Pack offers the best deal for getting the last turns of the season. For more details please visit the Spring 10-Day Pack page. There will be no upload from Blackcomb base for summer glacier skiing due to the on-going construction. Summer Camps will still be running but will use the Whistler Village Gondola and PEAK 2 PEAK to upload to the glacier. The ascent trails on Blackcomb will also be closed due to the lift investment project as it is not possible to keep them open in a working construction zone. The Farmers’ market will still run on the usual days and the Family Adventure Zone will remain open. 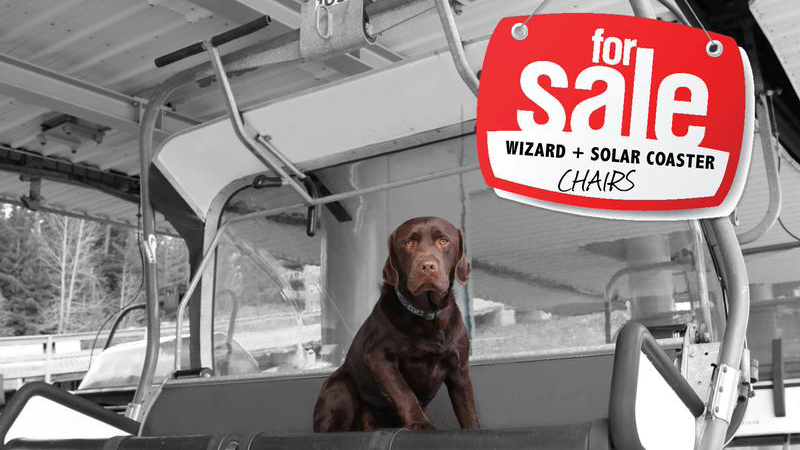 The chairs that will be coming off of Solar and Wizard are being sold by the Whistler Blackcomb Foundation as part of their “Chair”-ity Sale. Each chair costs $300 and you can even buy a Solar Express bubble for an additional $50. The chairs will be available on a first come first served basis. All proceeds will go to support the community through the Whistler Blackcomb Foundation. For full details on the size of the chairs, delivery details, and contact details please visit the “Chair”-ity Sale page.